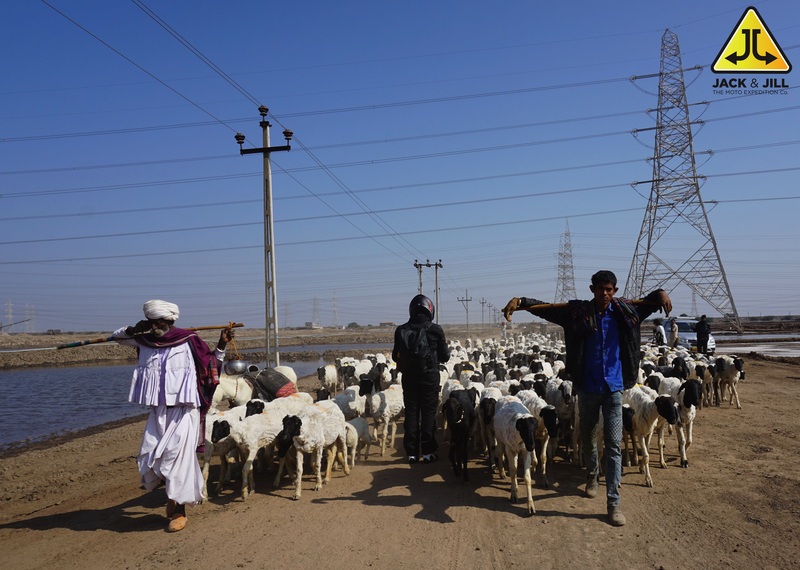 Agariyas, a hardoworking community in the region of Kutch. They are also known as the Salt extractors of the salt farmers of Kutch. They account for a good 75% of the total salt manufactured in India. Being so hardworking and so very dedicated to their they hard get something out of it. When someone doesn’t say yes, they’ll often give you a reason. A common trap: Believe the reason. If you start rebuilding your product, your pitch and your PR based on the stated reason, you’re driving by looking in the rear view mirror. The people who turn you down have a reason, but they’re almost certainly not telling you why. Fake reasons: I don’t like the color, it’s too expensive, you don’t have enough references, there was a typo in your resume. Real reasons: My boss won’t let me, I don’t trust you, I’m afraid of change. By all means, make your stuff better. More important, focus on the unstated reasons that drive most rejections. And most important: Shun the non-believers and sell to people who want to go on a journey with you. Serene and peaceful campsite overlooking the bright sunny sky and a turquise blue water shinning like a silver. it is one of this mesmerising view which can never been seen again not probably on the same day for it just looks better which each passing hour. We had the breakfast and with all the luggage ready to be packed again in the SUVs it was time to move on to the next destination and back to the civilisation. Besides everyone being so happy with the view and the fresh wind they had just one thing in their mind. A clean concrete place to stay where they can all take a good hot shower for a long time. Having no shower for all this while in the cold weather is absolutely fine but due to regular practice and upbringing we tend to be a bit fussy about it. 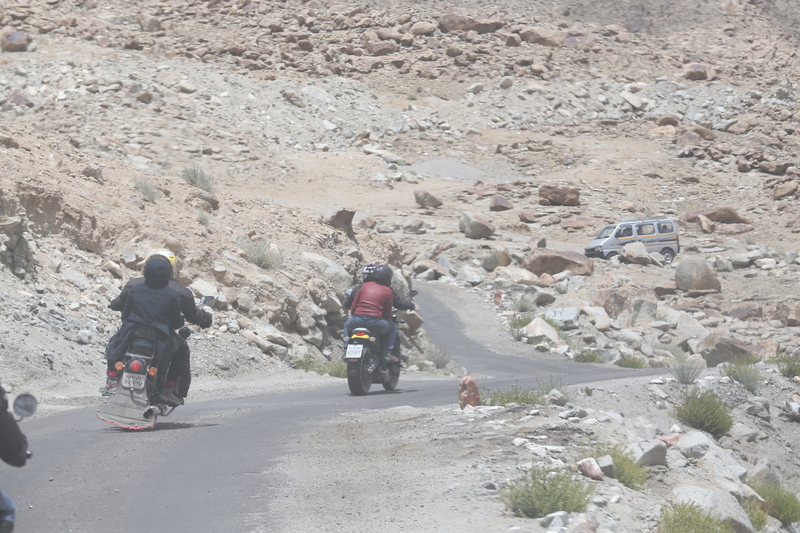 We moved on towards the city of Leh, crossing some of the very beautiful mountains and streams on the way. 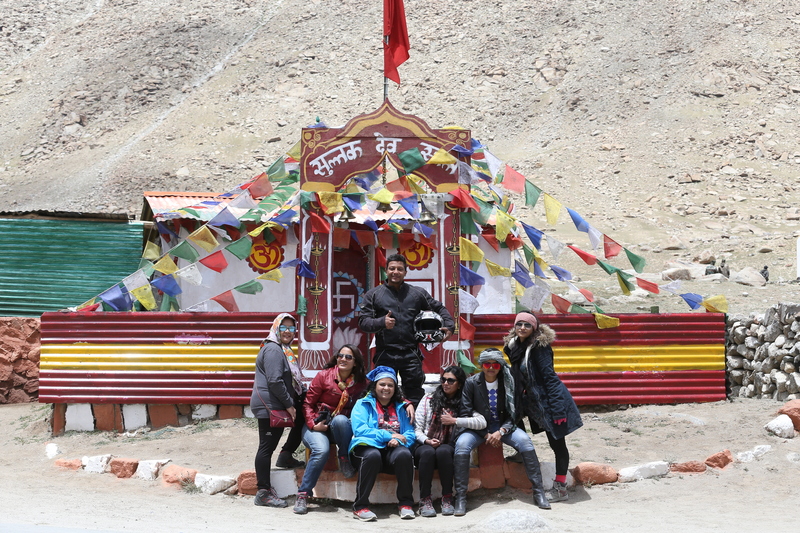 Everyone had that delightful face with a bit of an eagerness to see what would the city of Leh would look like. Stopping at one the place for some quick snack after a bit of a hard riding one of the females asked me if she could be a pillion with me up till leh. 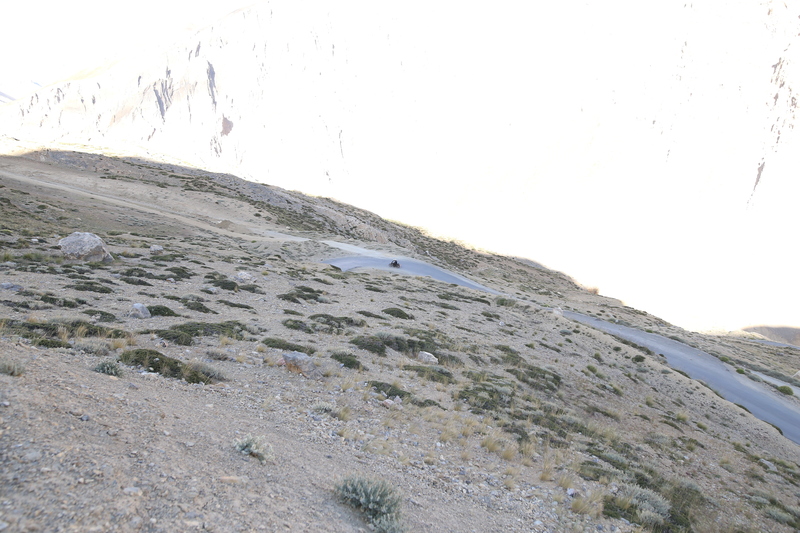 I agreed but asked to only hop on once we cross the ‘Chang la Pass’ the third highest motor able road in the world. She agreed to the same and we moved on towards the mighty pass. I was more than happy to be out there for it would be the very first time i would reaching the mountain with my own motorcycle. The joy and pleasure to reach out there on my own motorcycle was so very different. We finally made it. After a good what for some time i changed my t shirt and rode with my motorcycle to the very spot where they have mentioned the details about the mountain and the altitude. Not being aware of the sue system which followed up there too I just got in with the motorcycle. Some of the rude guys HAD to say something annoying to which I just apologised and asked if i could just take a photo and leave. They didn’t budge and had to keep on arguing about the entire thing. I swiftly moved back and let those idiots take the photograph only to wait for some more time. I just moved further after some time and asked the photographer to click a few shots quickly and leave the place. I was least interested, bothered and willing to take the photo out there but as we were out there might as well do the needful and LEAVE. The worst part of the road was over. With a proper tarmac and a lot of people seen on the sides of the roads we moved further to the junction where we could finally spot some ATMS, food joints and a store where you can buy anything you wish to. It was a bit of a delight to see some of the familiar things out there. We stopped over for the much needed lunch. Everyone looked tired, dark and roughed up to the core. Enjoying the proper food they all needed we all cheered for one guy who actually managed to finish the trip. it was the first time that he had managed to do a long trip and thet too on the rented motorcycle. Hats off and Bravo to the guy. We all cheered for him. Strangely everyone was on the phone checking there messages, emails and many other applications which they haven’t been in touch with since some time now. We moved further into the city and finally to the place where were to call the night. Big spacious rooms and bathrooms and the running hot water. Everyone was finally in their respective rooms and awaiting their turn to finally freshen up and relax. With the evening at leisure and no more riding for the day it was time to unwind and wear some comfortable clothing and enjoy the sumptuous food at a good restaurant. They say you can think better when you are fresh. Well, I was but the people in the group needed much of the comfort and cozy place to stay over after a couple of days of venturing out in the camps. Camping for a few days is fun but when the excitement in it fizzes out it just tents to take a toll on your mind. I had a bit of an issue with my rear brakes. They weren’t so effective which means I would need to do something about the same. Luckily the photographer had the connectivity in her cellphone. While everyone was fresh and some what ready to leave I happen to speak to the technician in the dealership who suggested i ‘Bleed’ the brakes. The process which he explained was so very complicated in the first go. Besides the process doing the same in this very terrain is a bit of a risky business as if something goes wrong i wouldn’t have any option but to go slow till the time I can resolve the issue. Being confident and a bit determined I tried and did the process a couple of times. Hopping on the motorcycle I headed for a spin and trial the brakes. it was a bit better but not too effective. The feeling of satisfaction you have once you have done something like this is beyond imagination. I was happy that i could do something myself and take things forward. 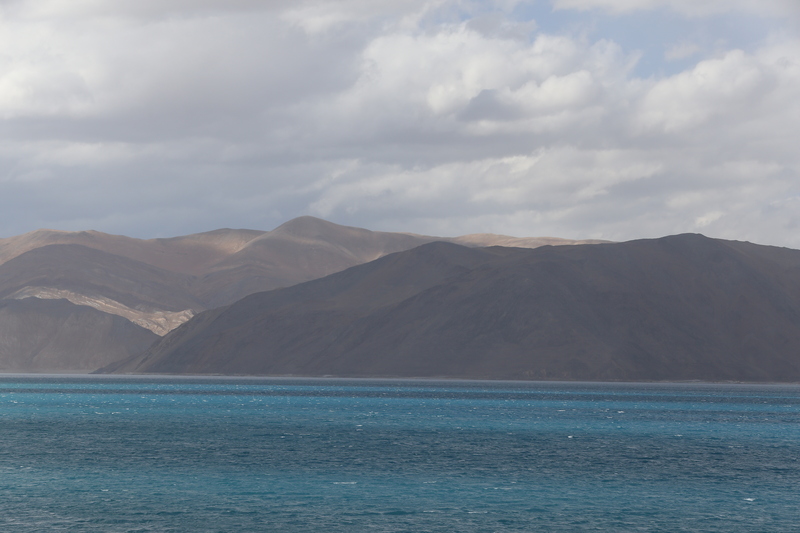 We were off to the mighty Pangong Tso Lake. The place is famous for many reason one of them being the Bollywood connection. 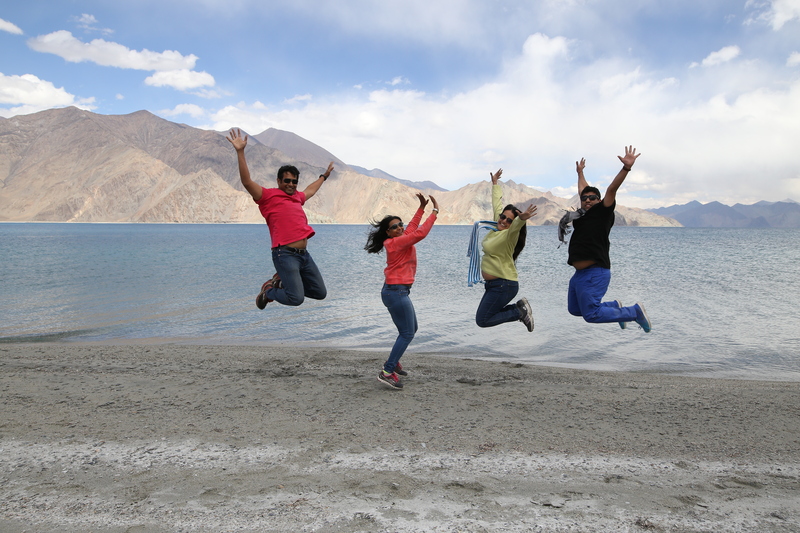 One of the famous movie named ‘3 idiots’ is shot on the banks of the lake. 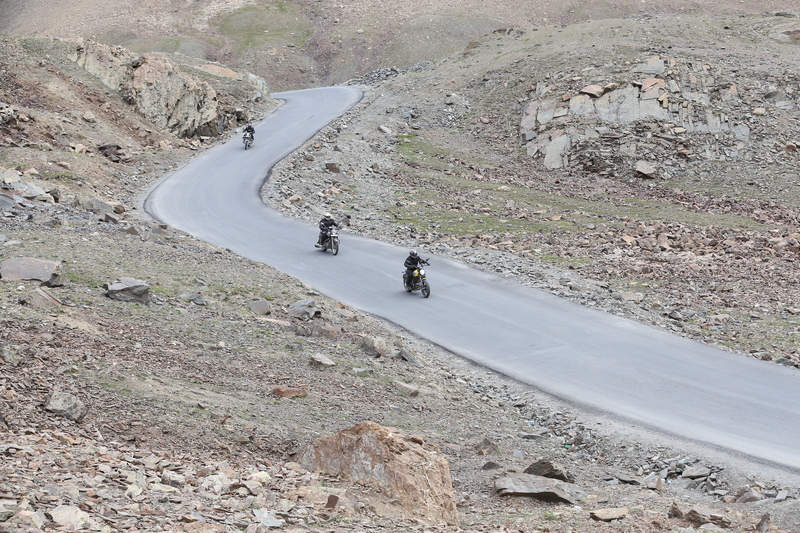 Riding on to the open road with some of the most mesmerising views felt so great and much on top of the world. It was a deja vu moment passing by the same road but at a different time and with a fresher mind. Approaching the ITBP (Indo-Tibetan Border Post) we finished the formalities. While doing so one of the female from the car happen to speak to one of the officers about the road conditions ahead followed by a way to the restroom. easing herself out she walks up to me and asked me if she could be a pillion with me on the motorcycle. With what I have known about her I suggested she sits quietly without dancing and jumping around or getting up on the foot pegs. She very happy nodded with a big smile and ran towards the car to grab the helmet and a thicker jacket. She was with me on the ride from the check post till the next stop where we halt for lunch. She was enjoying the view and as suggested she was quiet the entire time. I would always pin point something interesting while on the ride to share it with the group and to my fellow riders. It is just one of those simple ways to communicate without uttering a word to anyone ( I feel so). 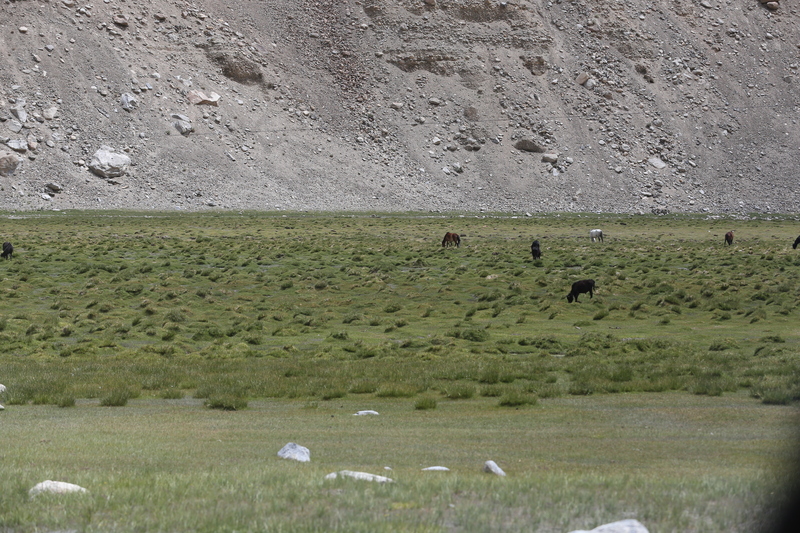 I did spot her some beautiful birds and some of the camouflaged army bunkers made on the higher parts of the mountains. It is so very different to guard this very barren land which belongs to the same country where our cities are. With the world of a difference between the two places we can only imagine what a soldier would have been going through by always been so very ready and alert at all times in this very virgin beauty. Approaching one of the check post I asked the female to sit in the car for sometime for there were some amazing roads ahead and we would want to take this opportunity to take some beautiful shots. She agreed with a smile but asked me if she could be a part of it again. I just gave her a thumbs up. The roads were indeed so very beautiful and I was happy I had some of the more isolated shots on the motorcycle riding it in the best of the ways i can. Reaching a small village i spotted a board which read “Satellite Phone”. I was a bit surprised and a bit shocked to see that board. Thinking if it was actually possible to have the phone out there. We stopped for a much needed break. Having some delicious noodles and omelette we chatted about the roads and how far we had to go. To which the reply for the locals were very straight faced and clear. “The roads ahead would bit bad” listening to which some of them looked at me” laughing off the moment I freshened up and approached the tent where the satellite phone was. I asked the guy sitting there if the phone was working to which he just welcomed me with a broad smile. The only person I could think of speaking to was the dealership to ask them about my rear brakes. They were effective but not too effective. Trying to call up a multiple times i got connected finally and spoke to some familiar voices. explaining them the issue they suggested I speak to them again in another 10-15 minutes for the technical teams needs to know about the same and it would better if they provided the solution thereby avoiding the errors. walking and stretching around for some time I called the dealership again. 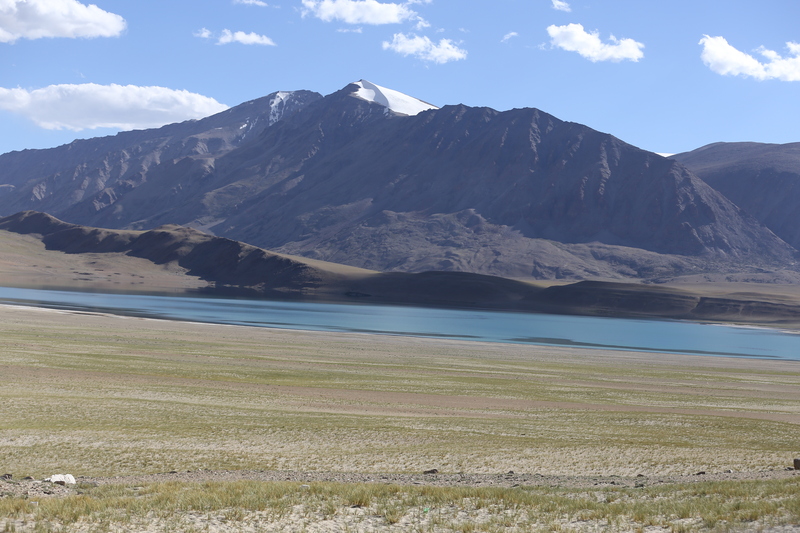 The explained the entire process in detail to which I just couldn’t do it in the real time but to memorise what has been told and do the needful upon reaching the Pinging Tso Lake. Thanking the dealership I bit a good bye to them on the phone and slowly asked everyone to get ready for we need to leave. After a point i just couldn’t ride further and had to stop over. I asked my friend if he could be of some help and ride my motorcycle for a some time. The roads were getting a bit bad and so was the weather up to some extent. He was delighted and happy to ride my motorcycle for he had never so far rode it for a long distance. He quickly was ready with his set of gears and moved ahead with the motorcycle. 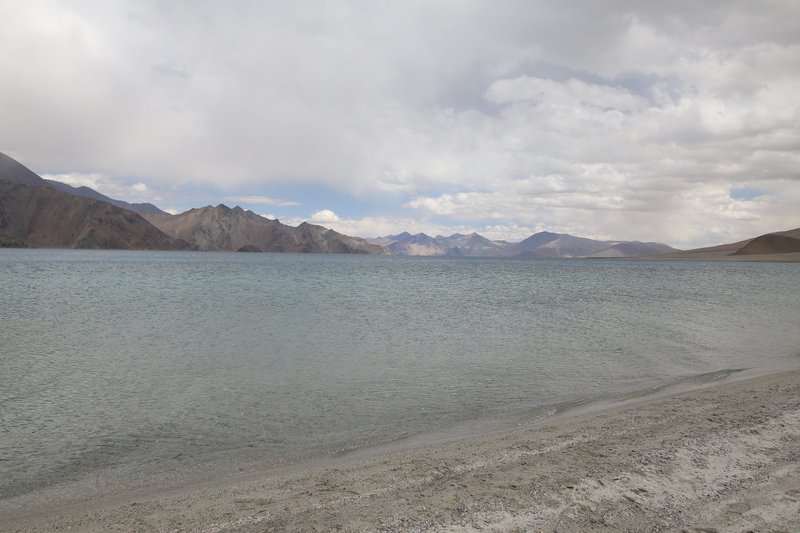 After a travel for a good 5-6 hours we managed to reach the mighty Pangong Tso lake. it was truly beautiful and something worth enjoying with every bit of it. Everyone stopped and some just asked from a distance “ can we take a dip in the lake” to which I replied why not? turning around to my friend who was already in his shorts to get into the water. Everyone enjoyed the splash and fun in the water clicking some amazing photographs. It was fun seeing them enjoy. We than let for the camps and called it the night. Get up ! Hello there, can you please get up ! with a bit of a surprise hearing the voice i saw our female photographer who was standing out there staring straight into my eyes. I was wondering what could have been the problem even after hearing and knowing what the problem was. She repeated herself again to which I immediately got and asked if i could take some time to be ready to take her to the army hospital which was close by. I gushed to the washroom and was ready in a bit and off to the motorcycle along with her. With that charming face brimming with excitement and fun all the times was done and way too pale today. It wasn’t the same. I wasn’t sure of what the problem could have been for all I knew was she had a headache. It can be due to many reasons. Guessing and self medication might just spoil the came and might make things from bad to worse. Reaching the main gate to the army camp I make an entry and take her to the Doctor who after listening to the whole problem asked her to lay on the bed and take the oxygen for some time. It was just the case of mountain sickness. With a sigh of relief I could see her steadily taking up the oxygen and feeling better with each breath of fresh oxygen which went into the lungs. While chatting with the doctor we happen to speak to him about how far the border post with China was and that would serious problems have the soldiers faced in this harsh climate conditions. It was great to know a bit about how the Army functions in this beautiful but treacherous terrain. Moving back to the camps we saw people getting ready and I was happy I had an early but not so pleasant start to the day but well it was great to see the hush hush to visit the next best destination in the itinerary. She was doing fine now and a bit fit too after the fresh oxygen input in her body. We head back the treacherous road crossing one mile at time. It was painful finishing that rough patch and on to the freshly laid tarmac. Riding slowly but steadily towards the next destination my eyes were longing for the tarmac. I couldn’t take the jumps and bumps any more, not at least today. I thought to myself. After riding for a good three hours I could see the tarmac. Phew.. I would soon be gliding on that road and would have a great chance to open up the throttle. Off I went opening up the engine and enjoying the wind fluttering my riding jacket. It was fun and so very enjoyable. The road soon led to the Indo-Tibetan Border post bridge. 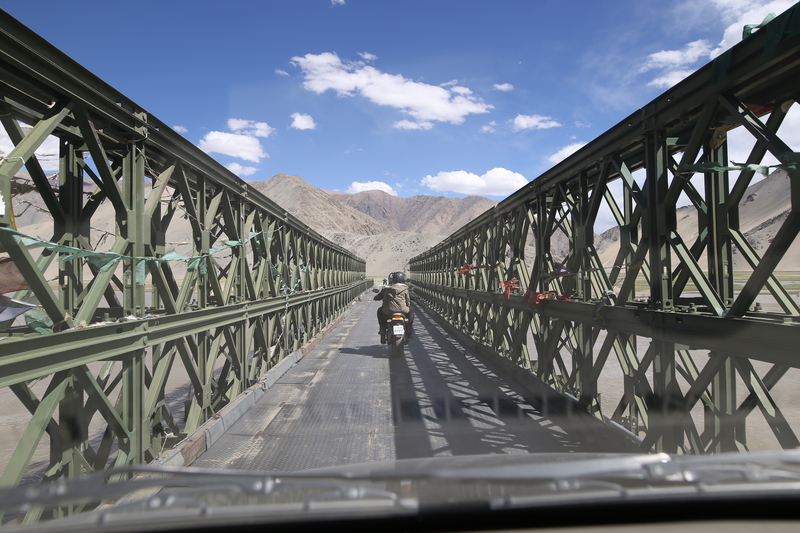 One of the very important bridge in the northern region which is guarded by the Tibetan and indian army jointly. Stopping over to prove the identity and furnishing the permits to go ahead I was asked by a few of the females in the group if they could join me for the ride on the motorcycle (at least for some time). I agreed to take one of the female who was more than happy waiting till now for her turn to sit on the motorcycle. Crossing the bridge i ask her to hop on and we were off on the beautiful, curvy and flat terrain road. The beautiful kept on changing with every few corners we took. it was just so very beautiful and mesmerising. She was enjoying the ride to the core and I could feel that for she never spoke a word and she was always looking on her left and right. Miles went by fast. real fast. 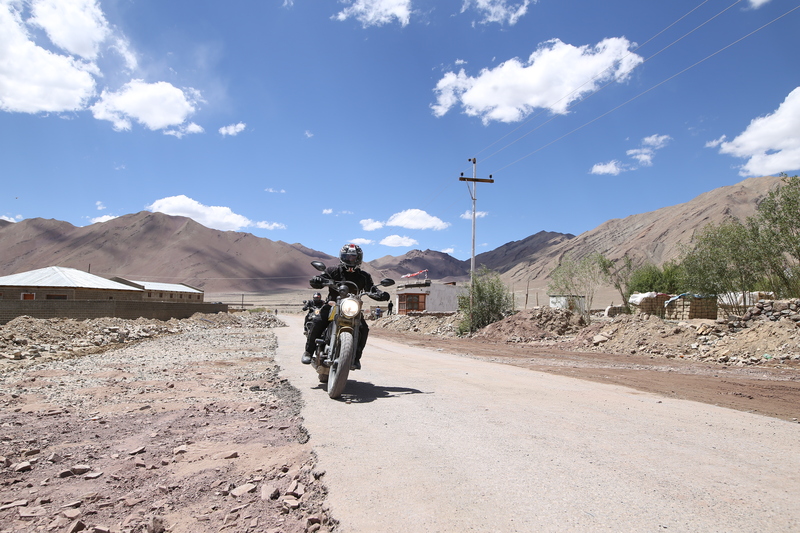 Approaching the village of Hanle. she asked me if she could go back in the car. I stopped over and waited for the car to reach us. 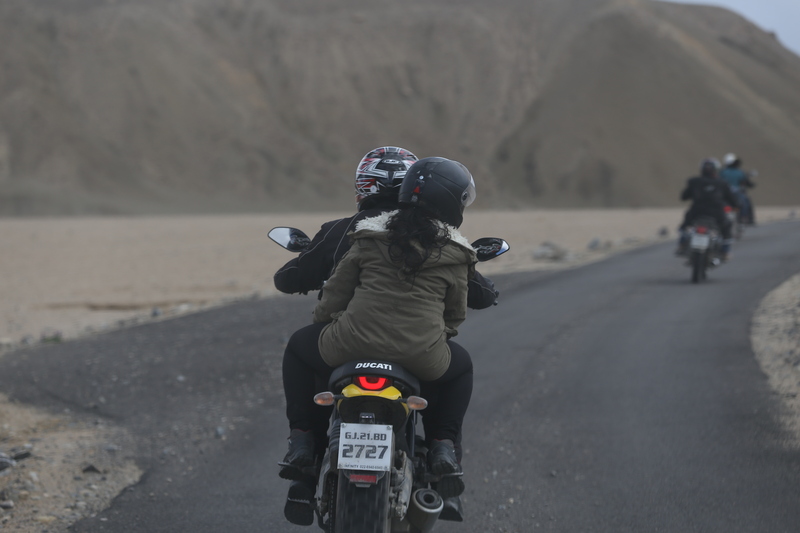 I asked her about how she felt being a pillion on this beautiful road on such a fast motorcycle to which she replied “it was one of the best ride i have had so far in my life” I was so happy and delighted to her about her experience on my motorcycle. Approaching the town go Hanle and seeing the beautiful village which hardly has a population of a good one thousand people in total. It was so beautiful seeing no banks, atms, fast food joints and the general chaos of any village. 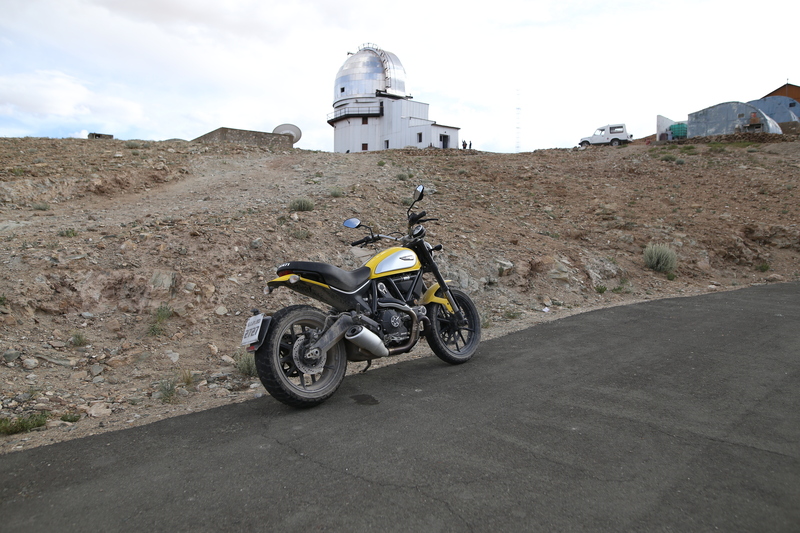 We approached straight to the Hanle Observatory where the biggest telescope of the country is and probably is also the highest observatory in the world is. Climbing up the mountain and seeing the silver dome which shine bright in the faded sunlight I was so very happy and excited to see the place and the beautiful it was surrounded with. Visiting the telescope and meeting the engineers in the observatory we realised it was no less than a dream come true to ride all this way and up to the telescope. The last stop for the day was at the homestay we had finalised for the night stay. It was a simple place with small rooms where you enjoyed the raw beauty and connect with the locals. it was one of those filled with lot of joy, beauty and inner happiness. The night was even more dramatic where we could see the moonrise and the bright sky full of stars lighting up the sky. it was so very mesmerising and so very unseen though we see the same sky from our cities it felt as if we were from a different planet or maybe we have reached a different planet. With the first ray of light we leave. Leave to a better place to make things happen. While on my way I was charged up and ready for some beautiful locations on the way but never to ready to some of the fast running water streams which i might have on the way. The moment the thought had passed my head I could see the SUV in the front being really slow and struggling with the shallow water stream. Feeling a bit less confident all of a sudden I readjusted my riding position and getting ready for the splash. Slow, steady and extremely focused i move on splashing the water and feeling confident with every inch i move forward with confidence. It was finally over. Relaxed and even more confident with what I just did I moved on. I go through a lot of emotions while i ride a motorcycle and this terrain just makes things a lot special. With no one around and nothing great to look at times i never wish to stop but to keep moving forward. 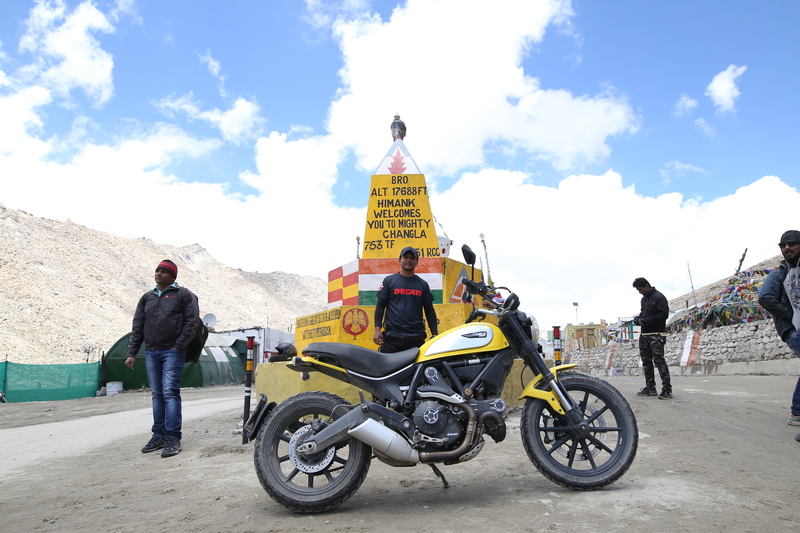 Soon, we approached to a famous Gata loops- a mountain filled with adventurous 21 hairpin bends making the view, the ride and the entire experience on a different level. I could see a lot of shortcuts but never actually dared to take one and move up for I had something so beautiful with me never would wish to see the motorcycle being scratched or damaged any further than what it had already gone through. 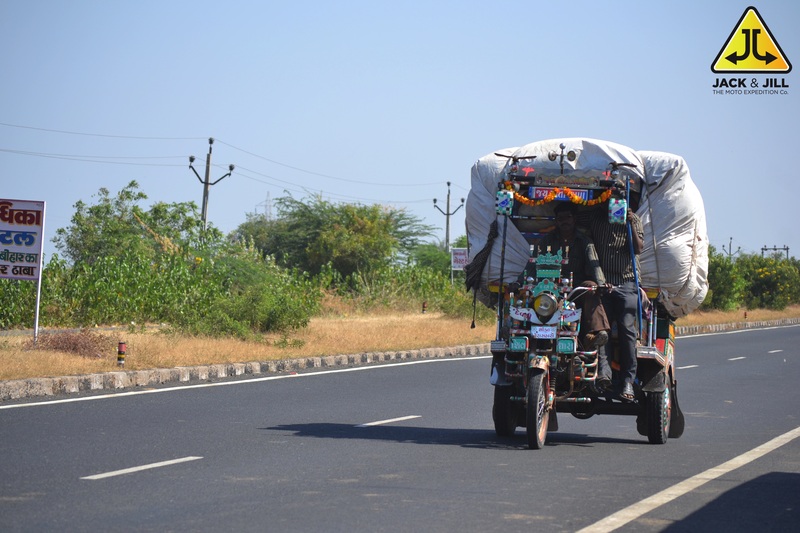 We advanced forward to a beautiful place called More Plains – a good 57 kilometres of a straight road which would make you wonder of every possible things you can imagine of while riding. 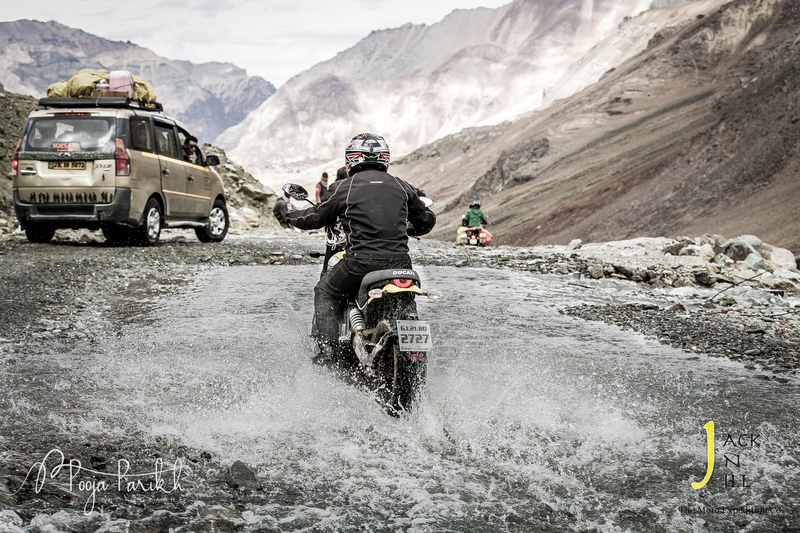 The road for a change is smooth and silky make it more and more provocative to riding fast and in the best of ways you can. But, there is a hitch. Every few kilometres of the very road it has a dump which if ignored can make you take a flight. It can be really fatal. Stopping over for a quick break for some photographs and some of the best things you wish to do in that very beautiful place. After a few photographs and a lot of stretching e move on. The break is much needed for the ride on this beautiful road can be beautiful, enticing and the best of your life but that would also make you feel sleepy. With caution and care we move forward. Unfortunately, we would have to take a different route. On the way we spotted so many motorcyclists and so many people on their beautiful bicycles. taking the right turn from the small town of Debring and towards the off road which than leads to a narrow tarmac road. The road was beautiful and could have been better only with a bit of an energy and a lot of hydration. The body joust couldn’t take it further and we had to call it for a short stopover to regain the energy and some fluids in that hot weather. With all the riding still to do i wasn’t in the best of the shape due to my funny stomach. it simply wasn’t forgiving and pleasant. I had no choice but to have more and more fluids to keep moving forward and to keep the group energised. After a short while we took a short break for some food and some rest for the route later was one of the most treacherous the motorcycle, human body and a human mind would have ever experienced. With half heart and absolutely no mood to ride on I had some food and some black tea and lot of water. There we go again moving forward to one of the most beautiful mountain lakes one can see. 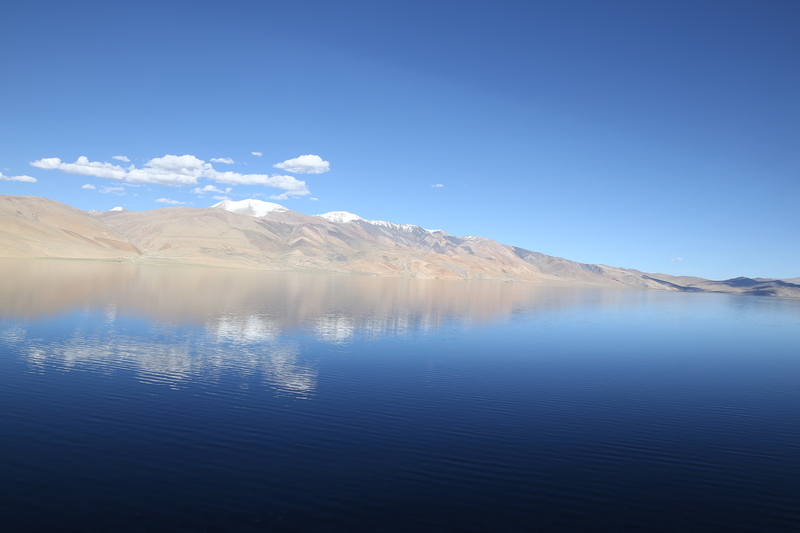 Tso Moriri lake is one of the places which is very close to the china border on one side and the Indian army camp on the other side. Moving forward into the treacherous terrain with the slow but steady I passed each rock with great care and patience. 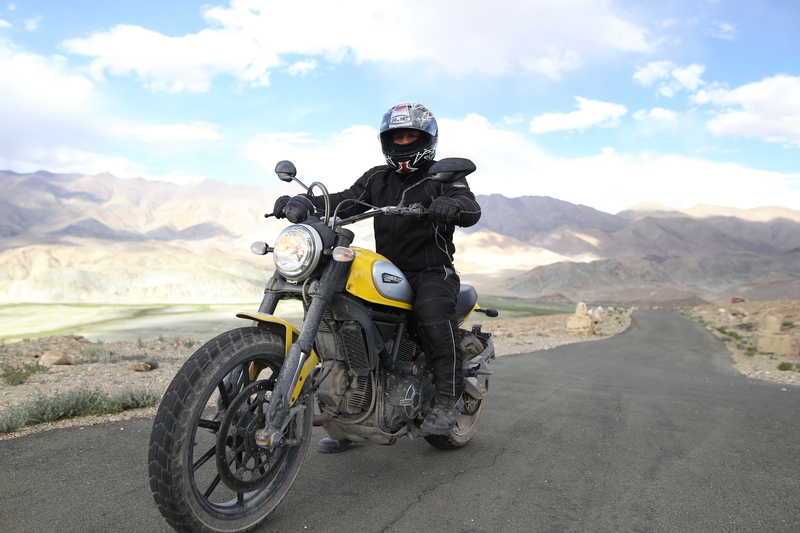 With such a beautiful motorcycle under my legs I had no intention to spoil it in any ways possible but just to pass through this tough terrain and be abiding to the mother nature and its raw beauty. An hour turned into two and than into many more hours. The terrain was simple unforgiving and so very tough to pass through. I stopped for a short time to let the engine cool down while i regain that energy and move forward. Moving forward crossing a few stones at a time I check the time on the dial the time has stood still. everything felt slow, sluggish and bumpy. The heart gave up but the spirit was willing. With that patience and determination I moved on till the time i could see a freshly laid tarmac. I simply couldn’t believe my eyes. I just couldn’t wait to be on it and enjoy the smooth road after such a long, tiring and super bumpy ride. I was finally on it. I revved my motorcycle and zipped through some of the corners and was in a snap lost in the mountains. i was back to life and the liveliest mood. The pain, stomach problem and that fatigue went way back. The view suddenly was breathtaking and so very beautiful. hours passed by and slowly the fatigue started sinking in. this time it was even more than what I had earlier. crossing one of the truck and taking a slow turn I stopped at one of the small tent which happens to be restaurant. it was the only one around for miles in between no where. Hearing the engine an old man comes out and gives me a sweet smile. a smile so welcoming and so very much from the heart. Waving me with an expectation that we might do a stop over and help him earn some money. I couldn’t resist but went close to the tent and parked my motorcycles. With a brief chat about the route and how long it was I could see the rest of the group joining in. I simply couldn’t gather up the energy to move forward or even hop on the motorcycle that mere 20 kms of a distance. My friend came over and asked me if everything was ok with me. Had no choice but to sound a bit strong but after a few other questions an offering to ride the motorcycle for those 20 kilometres was a proposal i couldn’t resist. With great effort and a heavy heart i ask my friend to ride my motorcycle. I looked at it and with a bidding good bye for a short while i sat in the car. completely exhausted and dehydrated I felt so much better on the seat. it was no less than heaven. The road thankfully was good too and i started feeling sleepy. The feeling didn’t last long though as the carpet road had vanished somewhere and we were back into the bumpy ride. Though the bumpy ride was a bit bearable in the car i was more worried about how would my motorcycle be. How would my friend be riding it? With ample thoughts I just kept myself awake till the time i could see the royal blue patch in between the dusty mountains. That was it, I shouted pointing the finger for others in the car who were busy gossiping about a million things in the world. It was all quiet after that and the only thing you could hear was all the praises about how beautiful the lake looks and the shutter sounds of the camera. we soon approached the Indian army check post where we had to get ourselves registered. Besides the motorcycles the entire group was around. I couldn’t help but ask the guard on the duty about the medical officer who can help me with my stomach problem. Swiftly pointing at one of the shades he suggested i go meet him along with one more person. No idea about the reason for the same but without asking him for the same and thinking more about it i asked my group photographer to accompany me. Besides being an amazing photographer she happens to be a Doctor by profession too. With a quick help from the army Doctor I felt a bit better once we reached the camp. The long day was finally over and that I could ease out myself and enjoy the beautiful lake which kept on changing the hues of blue every time you see it.